I'm doing almost the same thing. I run a weather model on a c3.8xlarge for 5 hours, storing the resulting data files on an attached EBS. Then I download a 42 Gb tar file to my local machine via scp. It takes between 1 and 1-1/2 hours for the download. Then I do it all over and over again, in a big loop that takes about a month to complete. It seems like a big waste of money to do it this way, and shouldn't take 1.5 hours to download 42 gig anyway. Ugh. 42GB in 60-90 minutes means 1GB takes around 85-128secs, which matches nicely my measured average of 114s (actual range over 5 attempts 98-128s) per GB on SCP. 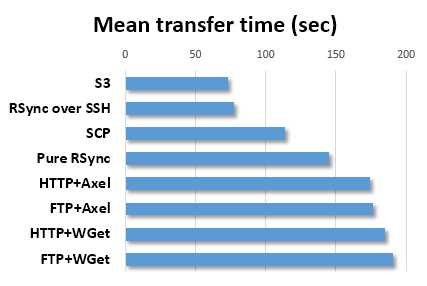 Extrapolating from my measurements, if you switch to Rsync, your transfer time will go down by 33%, i.e. it will be 40-60m now. However, unless you really need to have the files on a local machine, you could warehouse them on S3 - this is much faster (my measurements say it takes on average about 30s to upload a Gb from EBS to S3, which is 3x faster than SCP - 20m instead of an hour in your case). If one day later you decide to get all your data down from S3 (via aws cli) your *total time* spent on all transfers (including upload to S3 and download from it) will still be optimal (this is the first bar in my graph above). - Downloading from EBS costs around $90 per TB. - Transfers between EBS and S3 are free (within the same region). - Downloading from S3 costs about 10% more than from EBS (because there's a "request fee" added to the otherwise equal "data transfer fee").